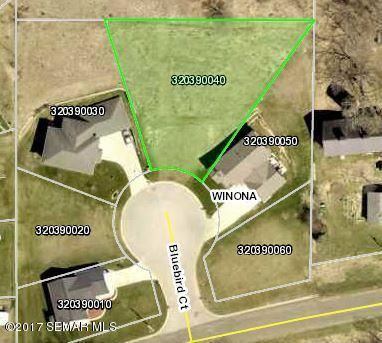 Fantastic buildable lot in the very desirable Bluffview Subdivision. Situated on a quiet cul-de-sac street in the valley with breathtaking views of the bluffs & southern exposure. City sewer & water and NO ASSESSMENTS. CALL TODAY! Take Hwy 43 /MN-43, go 1.3 mi, turn right onto Old Homer Road, turn right onto Bluebird Court, it will be the 2nd lot on the right. The approximate monthly Principal & Interest payment for this property would be $156. This payment is based on a 30-year loan at a fixed rate of 4.12 % with a down payment of $2,590. Actual lender interest rates and loan programs may vary.